Aw, shucks. Would that same error occur in the Steam build as well? When running run_win.bat in the Windows version. No log files have shown up since I have tried to run the game. I am using the Windows version, not the cross platform one. I have just noticed that when running the run_win.bat file, there's a brief error message that pops up on the screen before closing, making it near impossible to grab a screenshot. I ran Gifcam to grab what is attached above. I'm not really sure what this error means, though, but the files aren't logging it. I purchased the Windows version of the game (I have a Windows 10) back when it was on sale, went and extracted it, but the game doesn't run no matter what I click on. 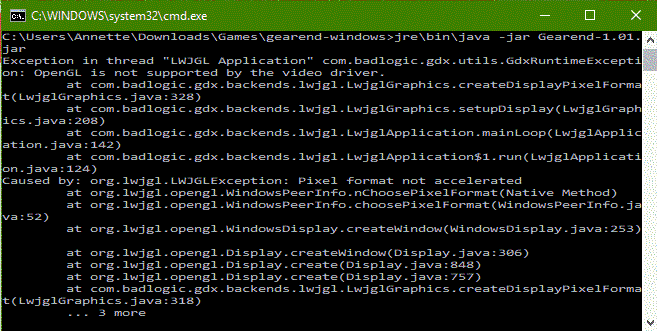 I've tried clicking both the run_win file as well as the .jar. For the former, the black command prompt window will appear for a few seconds, then briefly disappear and then nothing will happen. When the jar file is clicked on, the cursor indicates that it's trying to run the program (I think), but there's no window that comes up or anything. This was a pretty cute, enjoyable play. It was hard to tell where the lizard would lick, and I find it kind of odd that the hawk can just push you down and then pick you up when you walk upwards (considering how this seems to be a top down view of the playing field). The music's pretty cute, sound effects are spot-on. Overall, a very well rounded jam entry. It's a well made game, very simple but the controls are responsive enough. I didn't do very well because I wasn't exactly sure which GameBoys looked correct (I mean some had clearly misplaced buttons but others seemed fine, yet still didn't count). The music was a bit too loud for my taste. The sound effects were fun, though. Wonderfully fast paced, gets super challenging super fast. The jumping and running is a bit finicky, but I can forgive it because of the fast respawn. Also it would have been nice to have the restart button a bit more reachable to the spacebar, like the R key? I enjoyed the music as well; the humour in the dialogue text at the beginning is good. I love the idea of not only limiting the player's time per level, but also their ability to jump. Overall, I was heavily reminded of Hyper Pixel Man while playing. I didn't complete the game, but I'm wondering if later levels rely more on smaller jumps and thus force players to wait some seconds before doing so. That could make for a fun challenge. Well, I hope it's in there. I'll definitely pick this up again when I have more time. I'd suggest removing the two "surprise" spikes where my character is above here. They seem to be unnecessary, though I'm not sure if this is to prevent the player from going to the right (which they can do anyway once they land on the thinner platforms). That aside, this was a really enjoyable, simple, but challenging platformer. I thought the moving platforms were interesting and the most memorable part of the game. The music is great; it's got an intensity perfect for the challenging rooms. The sound effects are also well done, love the walking and key collection sfx in particular. I look forward to seeing more levels; perhaps, in the future, you could also consider a map? Interesting! The Raw and Overall scores were a bit confusing to me in how they worked. GBJAM 5 community · Created a new topic Favourites from the Jam? So the results are in, and I had a lot of fun playing the entries and overall participating in my third game jam by contributing music. My team tried to get through as many entries as we could, but only ended up playing and rating just over 60 games collectively. I did have some favourites from the pool. I am not a kid - It worked for me as a complete game, even though it only had one level. Maybe just me, but I'm a sucker for games that have these sorts of platforming challenges. Bob & Dob - I loved the relaxing atmosphere and the upgrade system was neat, the graphics were cute, the music was REALLY GOOD (smh so jealous), albeit the game overall was incomplete. Le Gatuno - This was simplicity executed fine. I also really liked the music and sound effects. A Mission for Brena - I'm probably in the minority here, but despite the issues I had with this game, I found myself thinking back to it like, "That was a fun experience. I really liked what I played." Kind of hard to explain past that, but I thought the boss was quite fun, the upgrades, once you get them, add a great pace. Dankest Dungeon - I think, out of all the Halloween related entries, this one got my attention the most. I love the mechanics and the levels, while short, were well designed. I might round this out to a top 10+ or something when I have more time. But since there were so many games, I tried to go for the ones with lesser ratings during judging for the most part. What are some of your favourite entries and why? Arright, I didn't get very far, but so far, I'm finding it challenging but enjoyable, in terms of the art and platforming. I see a bit of interaction with NPCs in your screenshots, which I'm interested in seeing. The sound effects are a bit on the grating side. Some music would be nice, but the sound effects would definitely drown it out. Overall, I think it's not bad. This is a neat idea. The moving cursor really brings me back to the days of my old TV console games. This kind of game needs some progression, maybe in the story and such. The music was okay but not exactly fitting for "band music". But I like this idea as a premise for a game a lot! Love the idea. The movement feels a bit on the sluggish side. Would love to see more variations in the types of hazards or mushrooms encountered as the levels progress. The death animation for the kitten is hilarious. Music's a bit clashy on the harmonies. Hehe, that was kinda cool. I like how "music" is solely portrayed through the sound effects and fanfares. The puzzles were pretty basic, and relied more on being able to move blocks without tipping them over, or pushing them with a good amount of force. It's a little on the short side, but it's alright for a jam entry. The menu is really buggy and the controls are kind of finicky. I like how the guy is trying to get away from the light, though. The music's okay too. It's strange how you can also shoot the boxes to regain ammunition considering the number of shots they take. I never figured out what the sneak function did. This is a great idea. I love how the skull bounces when it moves, and the use of the bodies and such. This definitely needs to be expanded; it's too short! I had a lot of fun with the puzzles. And yeah, the music does not loop in the area, which is a shame because it's actually very good music. Cute graphics; it wasn't obvious that the enemies were thumbs/fingers though. Anyway, I do like the design of King Poi's door. It's a very short playthrough, but I'm interested to see where it goes. The jump in the game feels way more vertical than horizontal, not to mention the limited scope of the game screen makes it hard to tell where you're jumping. But I thought the fighting was very fluid, so long as I was on a flat platform fighting the enemies. Interesting concept, a little too confusing on what you're supposed to do. I didn't get very far, but the graphics are nice, and I might come back to it once the jam is over. There could definitely be some more alternate controls for the space bar and Enter though. The current two are a bit of a stretch. But I'm curious to see how this game goes. Good graphics, appropriate palette for a game of this demeanour. It's nice to see games that take on historical events. I wish this game had a bit more of a progression curve to it, though. It just seems to throw you out onto the field (well, literally in this case :P) and it's all too confusing as to what you are supposed to do, especially since there are points when the enemies just spam bullets everywhere. I think maybe a tutorial is needed in the game itself. I'm a fan of the idea, but the execution on this doesn't feel solid enough. The difficulty spike between levels is quite huge. The camera jerks to the left or right with even the slightest tap of the arrow key. Because playing this relies on so many deaths, it would be a lot better to have a faster respawn system,maybe even simply putting the player back to where they started without a transition screen. I love the slow-motion to dash, and some of the levels were designed neat (I love the palette choice especially), but I didn't get very far because overall, the game felt more punishing than engaging. Some difficulty balancing is needed desperately, and maybe not having the camera move immediately when the player moves, because it makes jumping between moving platforms an absolute pain. Overall, really liked the mechanics. It just needs a lot more polish. I'd love to see a post jam version fleshed out of this. Good choice of music. The sound effects for the enemies are way too loud, though. I like the idea of the game, but I think the reloading isn't necessary. It's a challenge enough for players to navigate the level with a control scheme that they may not necessarily be used to in platformers, ie. pressing the key you want to go in actually sends you in the other direction. Combining this with the need to constantly reload and the controls, not to mention the sounds, become overkill. Personally I think the challenges are good, but the reload is not useful. Especially since you can reload an unlimited number of times anyway. Nice contrast in the four colours. The details in the trees make it unclear as to what such objects are. I assumed that they were all nests, yet once I collect a certain number of whatever is in the trees, I just end up dying. The upwards movement is also very unstable. The simple act of moving up a tree causes the squirrel to move at a slant, making the journey upwards more difficult than it should be. Heh, well, you got the pong sounds down pretty well. The music, well, felt a bit like pirate ship music to me? :P I just feel like a pong game such as this needs more happy, fun music. But maybe that's just me. For a pong game, I mean, it's pretty much standard. I do find it odd that when the ball hits the paddle while moving, it can send the ball into an almost perfect horizontal line, rebounding between the two walls. It takes a long time not because the ball is bouncing around other blocks, but sometimes just because of this very gradual upwards movement that can take quite a while before it actually reaches the blocks! This is a concept that has a lot of potential. I like the idea of a teddy bear defending its owner from nightmares, and the idea that collecting toys increases your powerups and that they end up in more challenging places at times. The teddy bear and nightmare graphics are nice. This really needs maybe a softer soundtrack, because the music does tend to get quite grating after multiple listens. Maybe different instruments or something. Also, for defense games like this, pressing and holding to shoot would also be a good idea considering how later enemies take many shots to kill. I'm also not fond of the instant respawn for this - something about the lack of transitions makes it seem a bit shaky. Maybe some knockback and losing the damage you can inflict is good enough instead of spawning the player back to that one platform. The number of nightmares that appear to scare the player is challenging in that of itself. Not to mention the graphics. Ooh boy, the background tiles do make it hard to look at. They need some different looks or something? I am not exactly sure how to describe it, but it definitely does mess with my head after playing for a while. Other than that, the game isn't super glitchy or anything, just in need of some more polish. It's a good start and I can see this working on a GameBoy console very well. The background graphics have a wonderful spooky feel to it; I love the details of the trees. I agree with Rey in that the 160 x 144 screen is way too small. Scaling is allowed, so long as the right aspect ratio is retained, if you didn't already know. The gameplay itself is more on the confusing side for me. There aren't any instructions present, so I'm not sure if I'm missing out on a certain control, but I got partway to a ledge that is slightly higher than my tallest jump, and found myself unable to get on top of it. I notice that I can stick to the sides of ledges, so I'm not sure if there is something present to get on top of there that I'm not aware of, or if it is a bug. For clarification, I've got a screenshot here. Critters causing a headache is right! The music gives off a great spooky atmosphere, but the sound effects of the jumping enemies get annoying pretty fast. They're a bit on the loud side. I did enjoy the narration over the game as the player progresses, however. It adds an engaging element to what is mostly linear gameplay (as far as I've gotten, anyhow). So if there's anything that needs the most polish, it's: adding clarification on how to play the game, ie. the controls (which could just as easily be put in the game's description page here), and scaling the game to a bigger, more visible size. And if the controls are just limited to the WASD keys, perhaps you'd want to look into the ledge that I took a screenshot of, as I can't figure out how to get up there at the moment. I like this one a lot. Makes for a fun Halloween endless shooter. A bit confusing on what you have to do there, but once I got the hang of it, it was pretty fun. The music's got that great haunted Halloween vibe to it, save for some strange high pitched note that leads in to the loop which I found to be a bit grating. The art is super cute though. I also like how the pumpkins control light. I really love how the GameBoy controls are displayed on the screen, and that they actually respond according to which keys you press. I take it this game only has the mouse for a shoot key? There weren't any instructions present anywhere, but this was a pretty basic game to get a grasp of. The controls seemed to respond well; the gameplay itself is basic but engaging for a short time. The music is also really good, and I didn't find the sound effects to be grating at all. If anything, the only thing missing from the game is expansion. A score system, maybe, different types of enemies and weaponry, because you definitely have a good start here for what was done within the scope of the jam. I look forward to seeing a future build! I think the idea of having to piece together and remember two separate parts of a level is interesting. Even when being able to flip back and forth constantly, you are also forced to maneuver through the level while doing so. The graphics are pretty cute, and serviceable to the game. The music is alright, a little on the repetitive side but not too distracting while playing the game. Most of the issues I have with the game are to do with the lives system and time limit. In earlier levels, I almost considered the lives system to be useless until checkpoints were introduced. If anything, I would say it might be a better experience for the player to have unlimited lives and simply respawn where you start from or at a checkpoint when you die rather than limiting the number of times you can do that before going back to the level screen (of which you can just go to the level you died on anyways). It would make more sense for future builds if you were to add more levels and such. But the thing that I didn't really enjoy was the time limit. To me, puzzle games like this don't need time limits. Having a time limit as a bonus is fine, but why punish the player for taking their time to figure out the puzzles on their first attempts? Granted, the time limit isn't completely aggravating, but there were a few times I was close to finishing a level, only to be killed by the timer going down. Aside from these things, I mean, the game itself is a cool concept and nails that GameBoy feel right on the head. It was just made unnecessarily frustrating in some areas by things that could more or less be directly addressed. Okay I'm not sure if the broken version refers to the download (which is definitely broken on my end) or the browser version linked in the install instructions, which is at least playable until my player simply did not spawn in the area I was whisked away to. Which is a shame, because I see a lot of things in this that I like. The graphics for the main character are good; I like the expression, and the little shuffle the character does when walking is cute. There were some interesting details in the art, particularly with the black and white pixels, which seemed to form the shape of a hand and foot. That did get my attention; I thought that was interesting. I like the idea of having to find portals, then being challenged to clean dirt and attack enemies. Instead of having the player just wander off the map until time is up, however, consider giving a portal leading back to the main hub that opens once you clean up all the dirt/pop all enemies(?). The movement of the character is sluggish in the main hub area, considering the relatively large amount of land you have to cover to find the portals. I also noticed some stray blue, literal "Text" written on the left side of the screen. I did like the music as well though. The main hub area theme has some nice tunes. Virtual pets were practically my childhood, so I knew I had to give this one a shot. It would have been nice to include maybe some mini games you could play with the pet? A good number of virtual pet toys include at least one sort of mini game. Perhaps something to consider. Other than that, I thought the game overall was adorable and nostalgic.